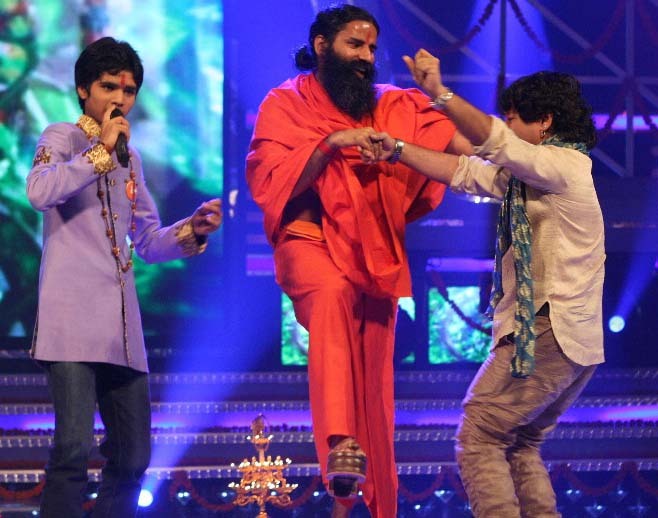 No one would believe that Baba Ramdev, who is known as the nation’s Yoga Guru, will rock the stage of Sa Re Ga Ma Pa Li’l Champs on his recent visit. This Friday, you will see a spunky Baba who will sing songs at the drop of a hat, pull anchor, Jay Soni’s leg, dance with contestants and make the audience roll with laughter with his rib tickling sense of humour. Baba Ramdev was literally “Baba Cool” who stole the limelight and proved that yoga can be fun and spunky with the right attitude. Later at a press interaction, Baba condemned Rakhi Sawant for targeting a sadhu like him to promote her show. Baba said, “People like Rakhi resort to such below the belt remarks just to gain popularity!” The media appreciated Baba’s unassuming gait and poise even though he was wearing three inch high wooden khadao’s (wooden sandals). Good to see after a long time Baba Ramdev in a happy mood, Baba ji you have given so many smiles to so many Indians but what congress gave you . We will not forget Ramlila ground episode. We will teach them in coming election.